This Small Accentor Flipper speaks for itself, it's just beautiful. 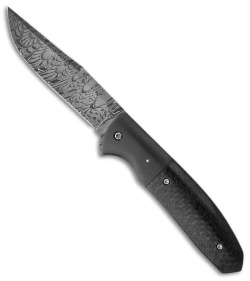 It features a Mike Norris Fire Clone pattern Damascus steel blade. The handle has polished carbon fiber scales and zirconium bolsters. 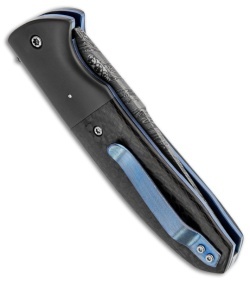 Orange peel blue anodized titanium liners and pocket clip. Chuck Gedraitis has been making fine knives for 17 years. His style is elegant and the attention to detail is evident in every piece he makes.